← another Christmas card for my sister! 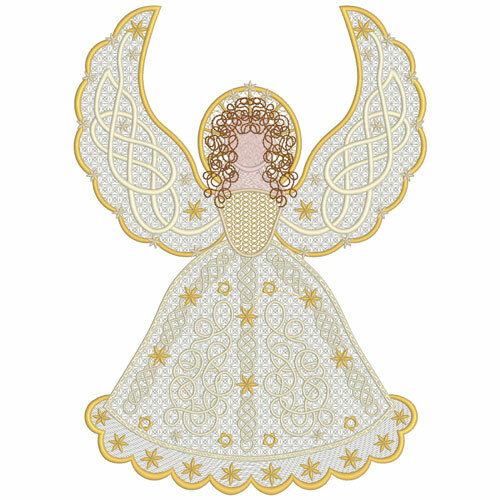 Since releasing my Celtic Angel I have been looking at her on the top of my Christmas tree and it has been become very obvious to me that she needs the option of another set of larger upright wings! I designed them last evening and will be working on them in the next few weeks, and then the set of designs will be updated to include this new option for you all at no extra cost. It is also my plan to create another angel with a different theme, for next Christmas but as yet I only have a few ideas in mind. Watch out for notifications. Have you seen the New Years design that is being given away at Graceful Embroidery? Email me as soon as possible if you want to receive this design which has been divided up into several parts with Outline alignment stitches (OAS) so you can place them accurately. The design is a compilation of elements from quite a few of my collections and I have given it a touch of spring. Believe it or not, I have daffodils coming out in my garden because it has been so mild her in southern England, and my fuchsias are all sprouting new shoots having never really been knocked back by a frost as yet. I suspect that proper winter weather will arrive soon and totally confuse my garden plants, but it is good to consider the wonder of a real spring is only a few months away. This entry was posted in Announcements, Discussing machine embroidery, New Designs and tagged Christmas, free designs, machine embroidery. Bookmark the permalink. OH yes Hazel I would love to receive the Happy New Year Design. Thank You. Please send me the New Year’s design. Thank you for your generosity! Hope you have an amazing New Year! I would love to receive your New Years design. It looks great. I purchased your Celtic Angel to make for my brother-in-law in memory of my sister Hazel who passed away November 2015. You released it near her birthday December 16th and it felt fitting as a remembrance of her. Thanks for adding the extra large wings, I think that will just add to her beautiful appearance. Thank you for the offer of the New Year design. I would love to have it! I would love to try the Happy New Year design! It looks beautiful. Please send it and thank you very much. Hazel, I would like to receive your Happy New Year design, at your convenience. And thank you very much in advance. It is very pretty and could be used easily so many ways. I would really like to have your New Years design if I may. I am looking forward to seeing the angel once you have the new wings. It is beautiful. I collect angels and would definitely purchase the designs from here on forward. And a Very Happy New Year to you. Dearest Hazel. What a beautiful design. I have been away and now trying to play catch up. If I am requesting this New Year’s design in the wrong place, I apologize in advance. I will attempt to go through all of my old emails and check for it. Hi Hazel, I would love to have the New Year’s design. It is beautiful! I am not sure if this is the right place to request this design. Thanks for considering my request. Happy New Year!! I would love the free beautiful design. Thanks in advance. Compliments of the season to you and the family. Time is flying bye and most of us are back to work. I hope the new years bring you plenty of Joy and Happiness you well deserve. Thank you for all you tutorials and gift i do appreciate them. My new year challenge is to make a quilt this year . i have a few ideas but still need to get down to plan one with your designs included. i would love the new years design to added to my collection . i am member and follow you closely. I hope you a beautiful year and love the new year design. Your blog is wonderful…thank you. Very lovely New Year’s design, I will search for it on your sites. Thank you so for your generosity…I too am waiting for spring, even though our winter has just begun. The New Years design is beautiful and I would love to have it! Hazel, like everyone, I would love to be included on the design! I love seeing how you combine different design elements from various sets of designs you have. Always helps stoke the creative muse. It is a beautiful design. Thank you so much for your generosity. Please send me the free design. thank you I am so grateful! Your happy new year design is refreshing instead of the standard type that that is generally available. I would love to have it. Hazel, I would love to receive the New Years free design. Thank you so much for your hard work. your designs are always the best. I would love to have the New Years design. Its beautiful as is all your designs. I would love to have the New Years design. I love all your designs! Thanks for your generosity. Has anyone received the file yet? Should be sending the designs out later this week.Thank you for your patience. I would love your New Years design it is lovely. I also think the Celtic angel is beautiful.. I am more than a little bit late but if the offer is still available, I would like to have this design. did I miss the new years designs ? I really want to get the angel !! soon !! I’m really waiting for the angel with the wings up so beautiful . I would so like to have the New Year free design. Many thanks. It is so beautiful. How do you download the file for the New Year’s Gift? 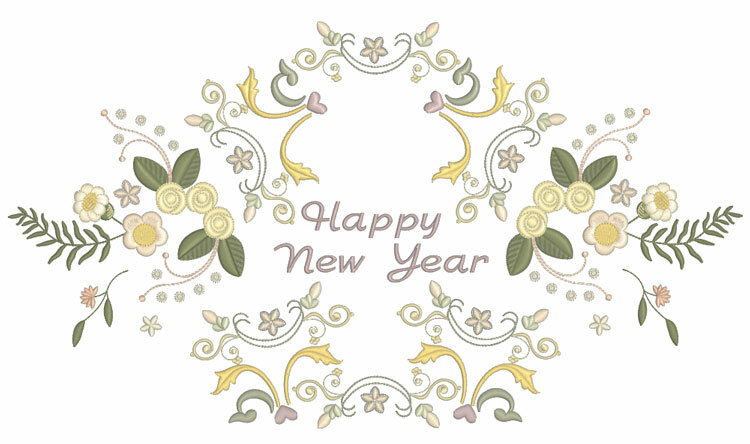 The Happy New year designs are no longer available free to my blog subscribers. However there will be more designs next year. If you are quick you can catch them as they have been released on my website and only cost $20.